This blog has been very quiet recently and for good reason. I’ve been working on a secret project that might well be my highest profile release ever, if I ever finish it. To say it’s been a challenge is understatement of the year, but I’m getting on top of it and making inroads now. In the meantime, I wrote a new short story! 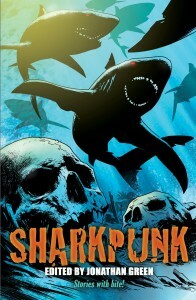 Last year I was invited by World’s Collider contributor and Pax Britannia creator Jonathan Green to write a story for his forthcoming anthology, Sharkpunk. This brand new collection of shark-filled action will be published on May 1st 2015 by Snowbooks. Contributors include Gary McMahon, Ian Whates, Steven Savile, Jonathan Oliver, and one of my heroes, Young Sherlock Holmes writer, Andy Lane. The stunning cover artwork is by Simon Coleby. It was lovely to be asked. I am not invited to anthologies very often, and certainly not to anything so high-profile. Even though I’ve never written anything like this before, this was an opportunity too good to miss and a fun challenge to boot. My story, Sharkbait, is about a diamond heist in Malta that goes horribly wrong, and the little girl who is forced to help out the perpetrators. Since I wrote it, the story includes some fantastical elements, specifically regarding the nature of this girl, who is something of a local legend. It was a tough story to write, but Jonathan was very patient with me and offered some excellent advice to tighten up the narrative, and now I’m really pleased with it. As a writer you usually have no idea if what you’ve written is any good until you hear what a reader or an editor thinks, and even then you don’t always believe it. I find that when reading the story over as part of the final galleys, looking for typos at a stage where it’s far too late to make significant changes to the story, that’s when I find out whether I’ve written something halfway readable or not. In this case I surprised myself. Readers might still hate it of course, but I’m quite happy with how it turned out. If you’re going to be in London on Saturday May 9th, stop by Forbidden Planet between 1 and 2 pm (GMT) for the launch. A dozen writers will be on hand to sign copies (sadly not me, since the commute is a killer) and it should be a grand old time. Check out the event page on Facebook. Be sure to keep an eye on the Sharkpunk blog for news, teasers and a series of interviews with the contributors, and “like” the anthology on Facebook. And I promise to try and update this site more frequently with news of my secret project, and updates on how Fantasy For Good and The Patchwork House are doing.